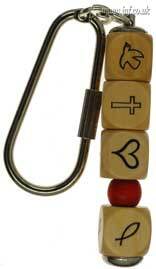 Symbol wooden bead key ring. Symbols in the order dove, cross, heart, bead and Icthus. Bead size 7mm by 7mm. Packaged in long hanging card.